16 oz. of cashews, dried cranberries, Michigan dried cherries, almonds, and pecans, as pure as nature made them, unroasted and unsalted. 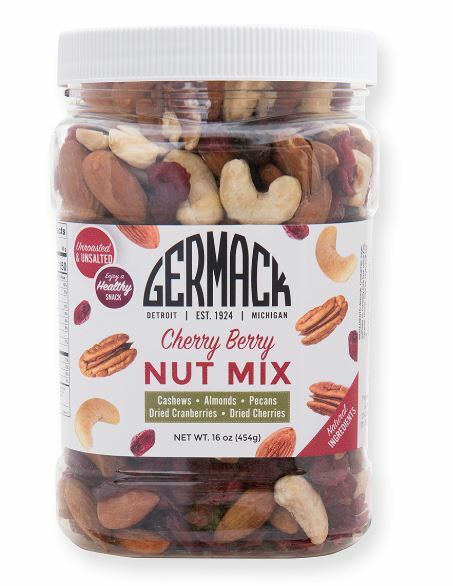 This incredibly healthy blend of natural unroasted unsalted nuts and dried fruits is a winning combination and our top selling fruit and nut mix! Wonderful for healthy snacking and an impressive party snack or gift item. The personal size resealable shatterproof 16 oz. jar is perfect for your office space as a natural snack.